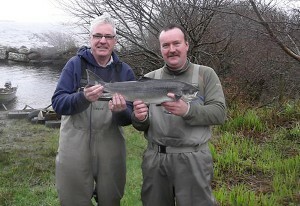 Fishing opened on Currane on January 17th. It was a wet and windy day. Diarmuid Devereux was fishing with me. It was his first time fishing on the opening day, and it only took him 20 minutes to hook the first salmon of the season for Currane. He landed a 8lb springer on the troll, near Morgans rock. There was quite a few boats out but this was the only salmon of the day.